In this age of digital media there's not much one can't find in a matter of moments. The trouble is - everyone is an expert and everyone has an opinion. Well fear not folks - i'm here just to explain what i did. My mini experiment. And notes taken. Use this information to formulate your own plan but PLEASE come back & leave your own notes in the comments. After all - we are all about having the best shoot possible and making women feel fabulous! In my research I learned milk flakes were the most common method for creating a milk bath. It seemed the easiest and most economical. (other options included whole milk, & creamer). However, when shopping I recognized that non-dairy creamer was nearly 1/3 of the cost milk flakes. Granted that's not anything in the grand scheme of photography but it did open my eyes to another option and perhaps it's the mad scientist in me - but i had to buy both and experiment! In case anyone cares - these are the brands I purchased while shopping at Shoppers Warehouse. Using only the highest levels of scientific methodology I busted out my Barbie swimming pool and let the fun begin! 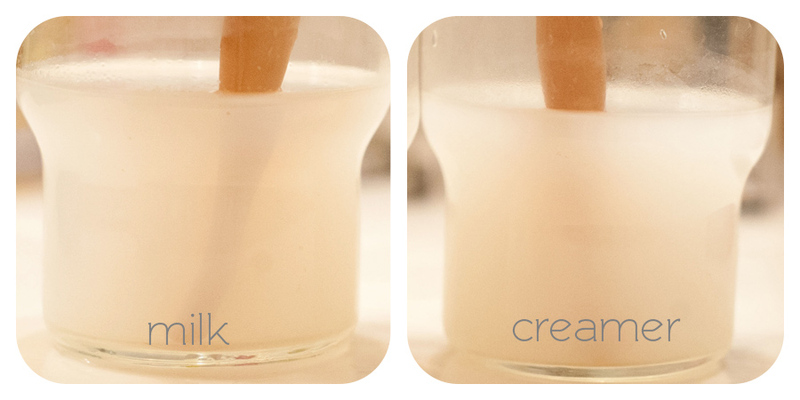 Mixing Ease: The powdered milk dissipated beautifully into the warm water. Little to no stirring was actually necessary to break down product, I just needed to mix. The powdered cream however was rather clumpy and took some stirring to break it down. If I choose this method, I will certainly mix in a mason jar first so i can vigorously shake and pour into a prepared tub. Smell: Little to no discernible difference was noted. Also noteworthy - neither was as smelly as I had read or expected. Film on top: both started out with a film on top. They both went away after approximately 5 minutes of sitting. Opacity: Cream seemed ever so slightly more opaque. I chose creamer as my milk of choice and I was very pleased with the results. Once I had my blender of choice, I threw caution to the wind and just dumped in a whole container for each client. That said - each client had different water levels and it worked for each of them the same. I.e. i didn't feel that those with more water in the tub were any more translucent than those with half the water. That said - since we had an extra box of the milk flakes laying around, my husband suggested I pop in the tub for my own impromptu shoot. The results of which are here and I can say from an editing perspective - there was no difference. And then for fun -- some images from various sessions I've had!